While federal anti-discrimination laws cover most businesses the fact is that workers remain hesitant to file a claim when they experience unfair treatment or harassment. The reason for this is simple; many employees feel that not only will their complaints be ignored but their situation will become worse if they speak up. Retaliation for filing a discrimination complaint, whether it be with your HR representative or the EEOC, is illegal but it is the employee’s burden to stand up for their rights. If you have faced retaliation following a complaint over workplace discrimination then our Georgia employment attorneys can help. Contact us today. Our lawyers service the greater Atlanta Metro area. Workplace retaliation occurs when a supervisor or co-worker takes negative action against an employee simply because they filed a discrimination complaint. This action may take the form of demoting an employee without cause, reassigning them to less desirable shifts, passing them up for a promotion for which they are eligible, or excluding them from office meetings. It may also take the form of office bullying, harassment, or other treatment that makes it different for the employee to do their job. 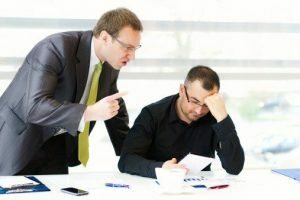 It is considered “retaliation” when any of these actions are the direct result of a discrimination complaint made against a co-worker or supervisor. Protection from retaliation is covered by the EEOC, even if an employee has filed a complaint that was dismissed or unfounded. Our Atlanta employment lawyers understand that your job is important to you and that it is not fair for you to be punished for standing up for your rights. During your consultation we will listen to gain an understanding of your case and develop a strategy for linking the behavior you are experiencing to the discrimination report you have made. We will advocate on your behalf with your HR representative when possible or file a formal complaint with the EEOC if necessary. When filing your complaint, we will ensure that the details of your complaint are clearly articulated and a clear tie between the negative actions and your discrimination claim are shown. Contact our attorneys today. We assist clients in the greater Atlanta Metro area including Jonesboro, Macon, Savannah, Athens, Kennesaw, Marietta, Decatur, Dunwoody, Stone Mountain, Tucker, Alpharetta, Roswell, Sandy Springs, Duluth, Lawrenceville, Lilburn, Norcross, Gainesville, as well as the counties of Bibb, Chatham, Clarke, Cobb, DeKalb, Fulton, Gwinnett, and Richmond. Many employees of private companies may feel that quitting their job is the only option when they experience discrimination. The lawyers at Obiorah Fields, LLC understand that you have worked hard for your job and you should not have to quit when you have done nothing wrong. We stand up for the rights of employees throughout the Atlanta, Georgia area and ensure that our clients receive the justice they deserve. We can often assist clients in retaining their current position while working out a resolution with the employer. If this is not possible, we can often help win or negotiate a settlement. Contact our office today to schedule a consultation.